Made by Umarex under license from H&K. 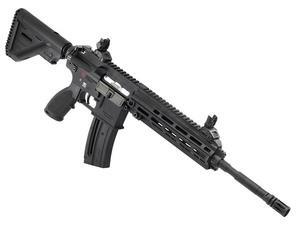 This HK416 22LR is a rimfire replica of the model used by U.S Special Forces. Chambered in 22LR and features a aluminum receivers, aluminum MLOK handguard, synthetic buttstock and pistol grip. Barrel Twist 1 in 13-3/4"